Not a lot of people read a newspaper anymore. It’s true. 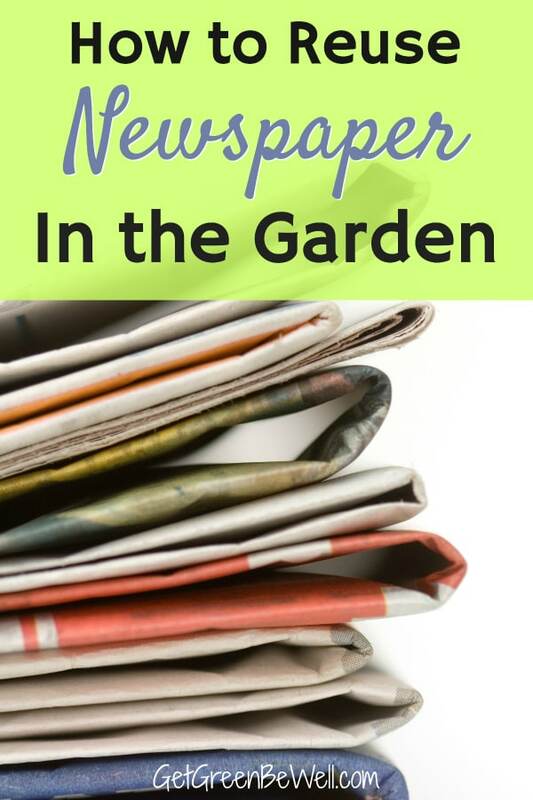 But if you DO, or if you have access to old newspapers, then you’ll want to use these tips to use newspaper to block weeds naturally in the garden! 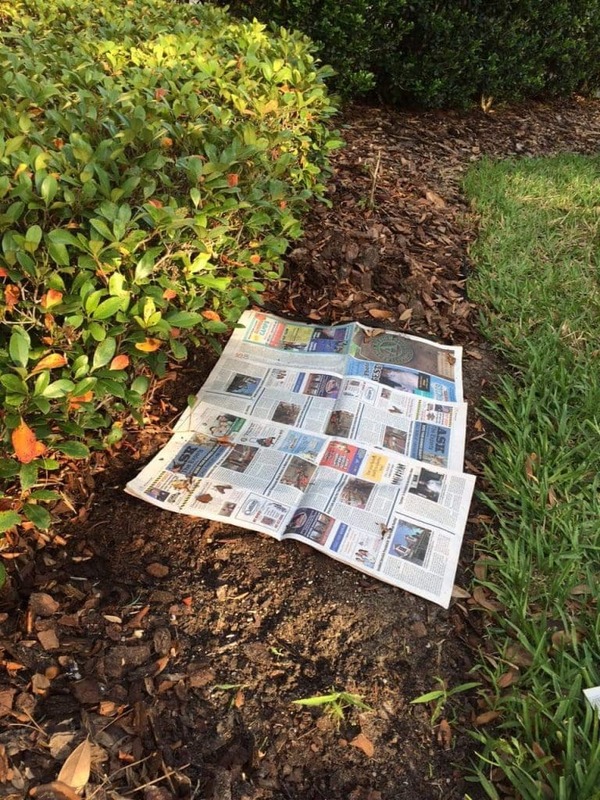 Newspaper is a fabulous way to block weeds from growing in your garden. If you put anything in your garden, you want it to allow moisture and water to go through. Your garden is constantly outside in the elements. Rain, sprinklers, snow and humidity all need to be allowed to escape the top of your soil and seep down into the lower layers of your garden soil. And if you are using a product in your garden that doesn’t allow moisture to move through it, that’s bad. It can kill your plants with too much moisture. If soil doesn’t have sunlight reaching it, then the weed seeds won’t grow as easily. So that’s why you want a light blocking product to help prevent weeds (such as landscape fabric). 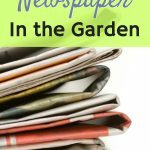 Is newspaper safe in the garden? Newspaper has changed a lot over the years. Once, newspaper was just plain paper and non-toxic dyes. Today, newspaper has a lot more vibrant colors, a lot more slick, glossy ads and the paper quality seems to be different. Still, newspaper is safe to use in the garden. Think about it. You might be worried about using newspaper and the dyes in your garden, but do you worry about the possible leaching plastics and chemicals from landscape fabric? Or the dyes coming off of dyed mulch? And while we’re considering the safety of newspaper in the garden, especially vegetable gardens, consider whether or not using newspaper as mulch will prevent you from using chemical weed killers. If you line your garden beds with newspaper, and the weeds are greatly reduced, then you don’t have to spray weed killer on your garden. And if you’re not using toxic weed killers, then you’re drastically reducing your chemical load in the garden. So here is how you use newspaper to block weeds in your garden. You don’t just lay newspaper on the ground and walk away. Not only will that look bad, but it will fly away. How thick should the newspaper layer be? Lay down 2-3 pieces of newspaper on the soil. Which means two sheets of newspaper total. Not two sheets of newspaper folded in half for a total of four pieces of newspaper on top of each other. Lay paper down just up to the root system of plants in the garden. Keep the paper about 1-2 inches away from the stems. What is the difference between lining your garden beds with newspaper and using landscape fabric? First of all, newspaper is free! So there’s a BIG bonus! Newspaper is also biodegradable. Which means that over a year or so, the newspaper is going to eventually disintegrate and decompose into the garden soil. This is a benefit for garden beds that are replanted frequently. Or vegetable gardens where you can change the position of plants frequently for proper crop rotation. Or if you truly want an all natural way to kill weeds. Landscape fabric will cost money. Plus, you’ve got to buy a lot of landscape fabric staples to insert in the ground. But, landscape fabric will last for quite a long time. However, I have had the edges of landscape fabric eventually fall apart because the lawn service would catch the edges with an edger. Then the fabric would shred. So the landscape fabric technically wasn’t always there. And I’ve found weeds grow up through landscape fabric more easily than newspaper. That’s my experience. 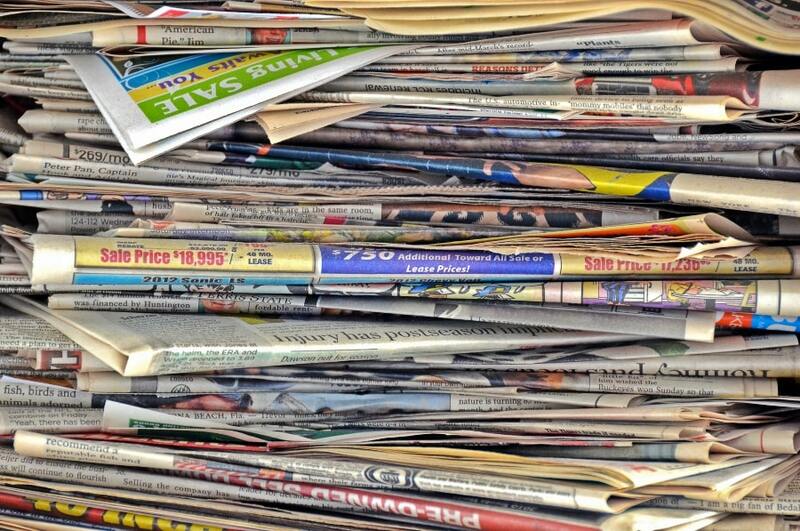 Using newspaper to block weeds is just one of many ways to reduce your use of chemicals in the garden. Check out these organic gardening hacks for even more ideas. Use plain white vinegar to kill weeds. It’s non-toxic and cheap! These four carefree, colorful plants are perfect for a stress-free garden. And here’s some great ways to get free plants for your garden. Sometimes, you can have a fungus gnat infestation (small tiny gnats coming out of your soil) if you use bagged garden soil outside or potting soil inside. I’ve found that using a different type of growing medium, such as compost, helps prevent this problem. If you’re looking for a cheap and easy large planter for container gardening indoor or outdoors, here’s our DIY for turning a Trash Can Into a Large Flower Pot Planter. Consider using these beautiful pots to grow your own tea to blend at home.